I�ve already briefly commented on the years with the History of the site, but I wanted to cover the years the site existed in a bit more detail. There wasn�t a lot of Oval Racing online in 2001, Rolling Start and Rogers UK Oval Racing pages were the sites I recall, Don�t get Mad Get Even covered meetings from the North East, Around the Pits covered the F2 scenes, Do You F2 had come and gone, Kevin McQueen�s site was just starting out, and a few photographers had sites, Matt Bull being the one that sticks in my head. The Internet was a slow thing to get connected to, after a lot of R2D2 speak from your modem then eventually you got a slow connection to the internet, which was prone to disconnecting itself, or when it did work prevented everyone else from using the phone. One evening, I in mid February I was browsing through websites and clicked on a link in Matt Bull�s site for �creating your own website for FREE�. 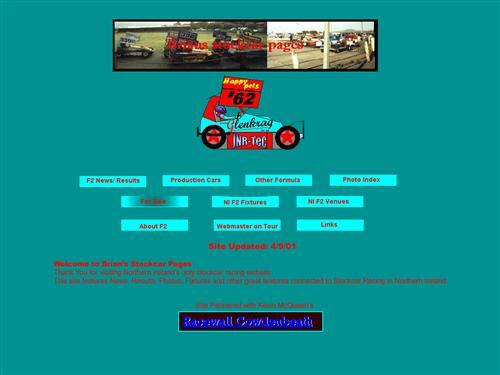 I clicked on it, spend rather a lot of time pondering what I�d like to put on my website, slept on it, and decided I�d build a Stock car racing website, an F2 one. I�d been following F2 all my life, I attended most of Nutts Corner Raceway�s meetings, it seemed a good idea. I�d no digital camera, no scanner and so graphics and photos had to be �acquired� from elsewhere or made from scratch..... in MS Paint! 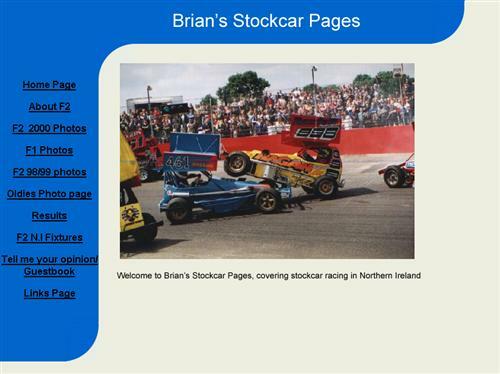 The first site was born, and to no surprise had a picture of Graham Fegan on the homepage which had been �acquired� from Matt Bull�s site, from the gallery of the previous year�s European Championship at Northampton. Web design was new to me in 2001, the internet was pretty new to me as well, everything was a learning curve. The initial site was build using an online editor, the next version of the site was built using Frontpage, but I hadn�t worked out how to use tables, so it too was a pretty poor attempt. Content is King as they say, and being the only stockcar site in the province at the time word started to spread and the hit counter started moving. The website end of things aside, what about the racing I hear you ask? Well in 2001 the site mainly covered F2, so of my notes it�s pretty much all F2. 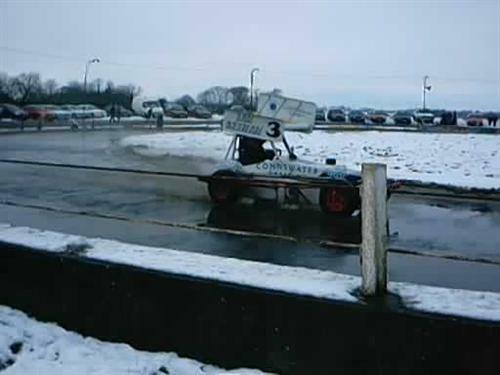 The season got off to a slow start with a 6 car turnout at Ballymena (3 of which were Fegans) and a dispute over prize money seen the cars trailered without racing a final. 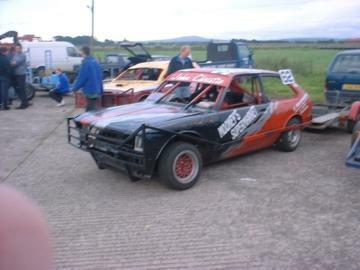 One F2 turned out for the next Ballymena meeting which meant no F2�s racing at it too. At the end of April Gavin Fegan took the first final of the season at Nutts Corner Raceway where fourteen cars were in attendance. 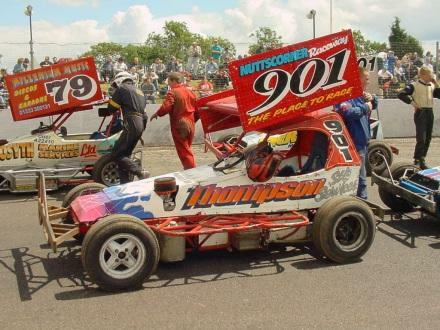 In May Ian Thompon took 3 final wins at Nutts Corner, with Colin McCready and Trevor Moore other final winners. 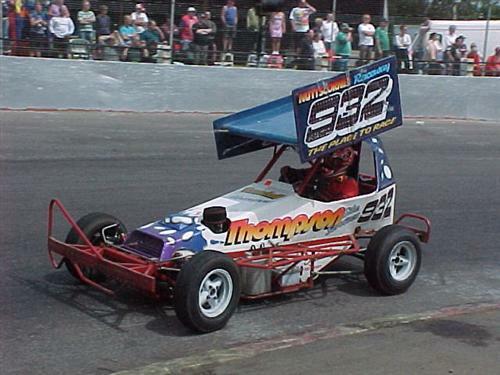 Graham Fegan took the final at Ballymena where the F2�s returned. 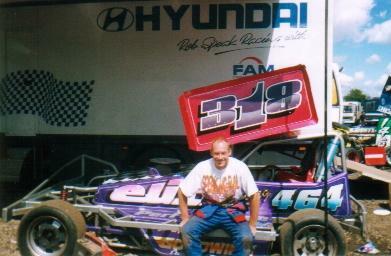 In June Ian Thompson took another 3 final wins at Nutts Corner, with Jeff Minish picking up the other win. The Irish Open Championship, and the pinnacle of the local season was cancelled due to the ongoing foot and mouth academic at the time, with Ivor Collins being the only visiting driver who made the trip to race the Wednesday meeting at Nutts Corner. Ian Thompson won the Nutts Corner meeting at the start of July. Four finals in August brought four different winners, with Gavin Fegan, Ian Thompson, Jason Winning and Gary McFerran taking home the trophies. Gavin Fegan took the opening final of September before the NI cars set off for the World final at Northampton, which had been switched from Barford due to the foot and Mouth. Ian Thompson, Graham Fegan and Gavin Fegan took to the grid. 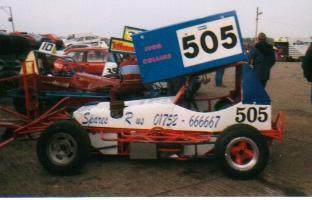 Daz Kitson retained his gold roof after losing the lead mid race when he got tangled with Dan Holloway. Gavin Fegan took the next two local finals with wins at Ballymena and Nutts Corner. With Fegans and Thompson trading wins and blows all season the Irish Championship was set to be a rough one with Ian Thompson on pole, with Graham and Gavin upfront for company. The flag had hardly dropped when all three found their way into the ropes and posts on the first bend. Darren McKinstry became the biggest benefactor taking the 2001 Irish Championship. Graham Fegan, Daryl Fegan and Ian Thompson took the last 3 finals of the season, which seen Ian Thompson crowned points champion. Version 2 a little better.